In theory you can have a great pinball machine without having a great theme. STERN, the only manufacturer of pinball machines has just released Wheel of Fortune. 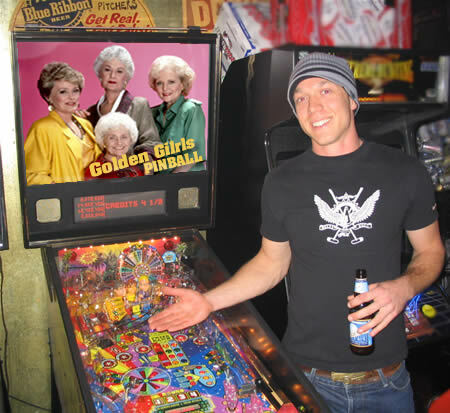 When I first heard of Wheel of Fortune pinball, I was thinking it could be pretty cool and despite the geriatric theme it might actually be a fun table to play on. Angelo’s in Portland was the first to pick up the new machine and so far the verdict is that the new game is horrible. I must admit the graphics and displays on the game are really cool and the actual wheel isn’t that bad, it’s the shots the drains the bumper in the middle and about 100 other things about this machine that are just wicked. I guess not all machines STERN produces can be winners, I’m going to say that Wheel of Fortune is probably better than Nascar at least. Spiderman pinball was and is a totally awesome game, I hope that the next machine they produce (Transformers?) will be more thought out and have a bit better play to it. What is the demographic of pinball players really? Here are some ideas for pinball machines that will reach out to that older demographic that Wheel of Fortune seems to be marketed towards. Wilfred Brimley’s Quaker Oats Party Pinball? I’m sure the list could go on and on. The theme doesn’t really matter as long as it has good play. I’m wonder what Crocodile Hunter is going to be like?? ?